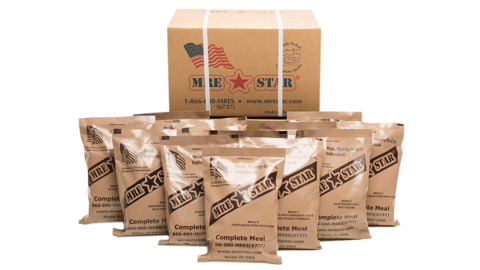 MRE Meals 12 complete meals are individually packaged and hermetically sealed – watertight and freshly dated for maximum shelf life. The M-018H is our most popular MRE meal product for good reason. The M-018H is a premier military spec Meal, Ready To Eat. No water is required to reconstitute the MRE meal. Each case stocks 12 hearty and delicious single complete meals averaging 1200 calories per meal kit. These 12 complete meals are individually packaged and hermetically sealed – watertight and freshly dated for maximum shelf life. The M-018H is utilized by Federal, State and local government agencies across the United States to feed essential personnel. The M-018H is the perfect choice for many types of consumers who appreciate the peace of mind in knowing that they always have a healthy and nutritious meal waiting for them, whenever they need.